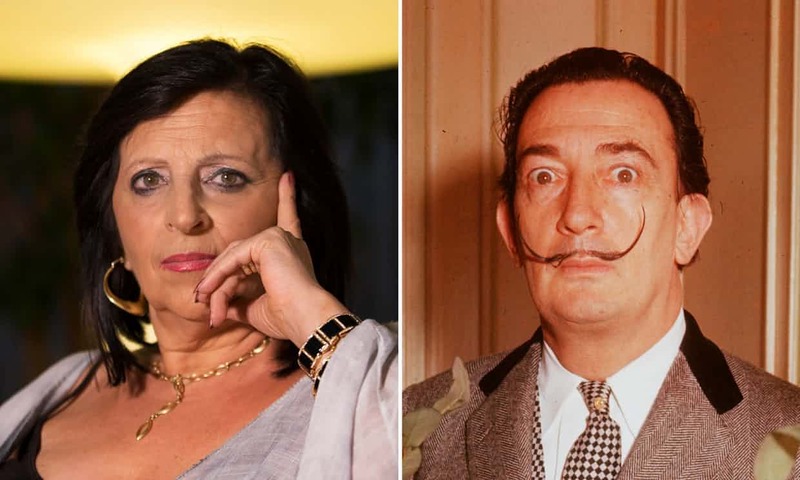 DNA tests on the exhumed body of Salvador Dali have proved that the Spanish woman who brought a legal case was not the surrealist artist’s daughter, according to a statement released on Wednesday by Dali’s foundation. The foundation said the court supervising the tests had informed its lawyers that the woman, Maria Pilar Abel, was not Dali’s biological daughter after comparing her DNA with samples taken from Dali’s remains. A spokesman for the court declined to confirm the results of the DNA tests. July 20 2017 10:20 pm, Madrid, Spain: DNA has been recovered from the body of surrealist artist Salvador Dali in order to prove the legitimacy of a claim made by tarot reader Maria Pilar Abel, who claims to be the result of a liaison her mother had with Dalí in 1955. The lunar eclipse of Aug 7 2017 at 15:25 Aquarius falls in Dali’s 8th house (DNA house) and is conjunct his natal Juno (17:29 Aquarius) and his progressed Saturn retrograde in Aquarius (16:05 Aquarius) – apt for the question of paternity and for legal right to an inheritance (which Dali bequeathed to the Gala-Salvador Dali foundation and the Spanish state). The transiting south node in Aquarius is also in the 8th house, the north node in Leo in the 2nd house. They will continue to tour these houses through April 2018. Both houses pertain money and sexual matters. Leo 2nd house is also a statement for artistic wealth. Noting that the Leo archetype aslo correlates to children, Aquarius in the 8th could certainly represent a child from an extra marital affair. Transiting Saturn retrograde forms a conjunction with Dali’s natal Ceres (20:17 Sagittarius) (a possible indication of Pabel’s mother who was a servant to Dali) and opposes Dali’s natal Pluto in Gemini in the 12th house (potential indication of a casual secret affair). Transiting Uranus in Aries is conjunct Dali’s progressed Jupiter retrograde (29:57 Aries) in the 10th house. 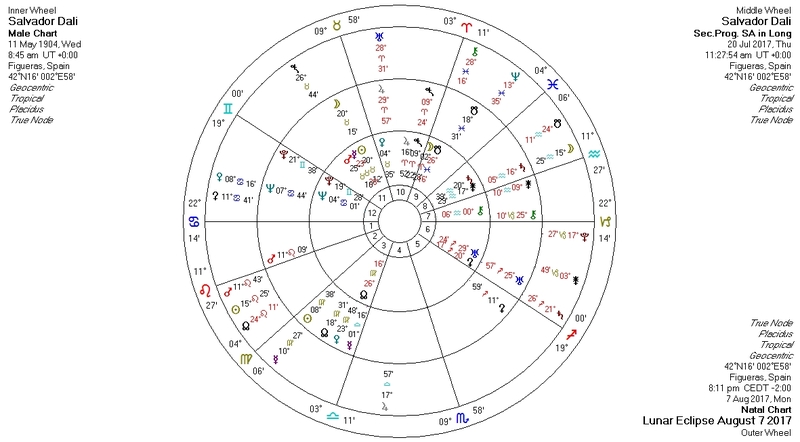 Jupiter is a father archetype, the 10th house represents legitimacy and the transit of Uranus over progressed Jupiter retrograde brings “enlightenment”, in other words, exposes the truth. Transiting Chiron in Pisces retrograde is conjunct Dali’s south node (makes a final pass over the south node in February of 2018.) Chiron in Pisces is an apt influence for the unknown or absent father. (Chiron’s mythology). Chiron in Pisces and in ths 9th house is a statement for a famous father. It may also be a statement for a well known family secret as Maria has stated was the case. It is suggested that the results will be known in approximately 2 months.